There are bags on which you cannot risk a bad seal. A 15-20 kg plastic bag or a multi-layer bag full of chemical, pharmaceutical, or food products often has a very high value, and the seal must be perfect. No matter if you need to seal only a few bags or large quantities, high standards must be maintained, regardless of the operator who happens to work at the end of the line. Cibra’s impulse bag sealer model PN Prg covers all these needs. A state-of-the-art control system allows to set precise parameters for the sealing cycle, and guarantees their total repeatability. A display with 8 lines of 21 characters each allows ready access to the main functions. An user-friendly menu allows access to additional control parameters. cooling of the seal can be set in seconds, or in reference to a temperature set in °C or °F, or in reference to a percentage of the sealing temperature (these two options can help in saving time). Up to 5 sealing “recipes” can be stored and the screen shows which program is operating.The screen also shows alarm signals on a key that allows to see the alarm list. Another key allows to start the sealing cycle from screen instead that by pedal. System has an auto-calibration system that can be activated from the display.Menus and under menus allow, among other things: to protect setting by 3 levels of access; to set and visualize a stroke counter; to set and visualize a clock; to visualize a system stroke counter that cannot be modified. The control system has a RS232 interface to log all data. The sealing bands can be 4, 6 or 8 mm wide. Sealing cycle can be started by pedal, or double pushbutton, or by the key on the control display. 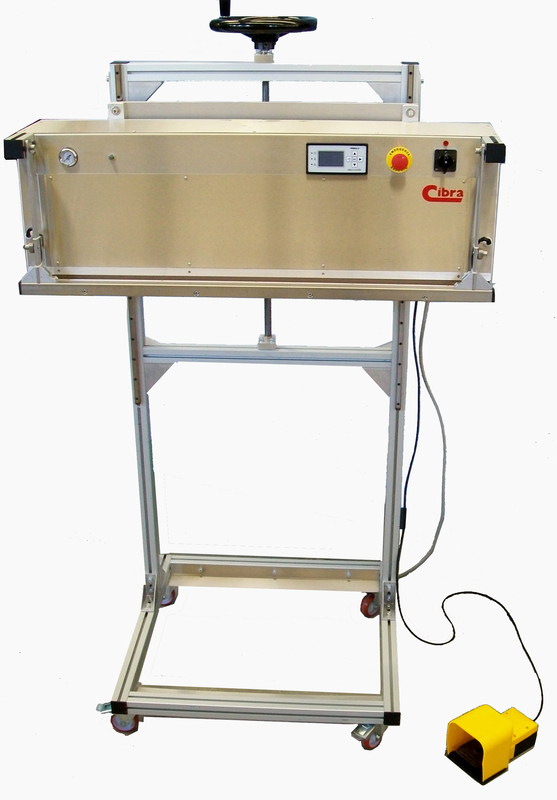 Sealing width can be 60 cm, 80 cm or 100 cm.The basic desk-top sealer can be fitted on a vertical support complete with wheel to move the sealing head up and down. 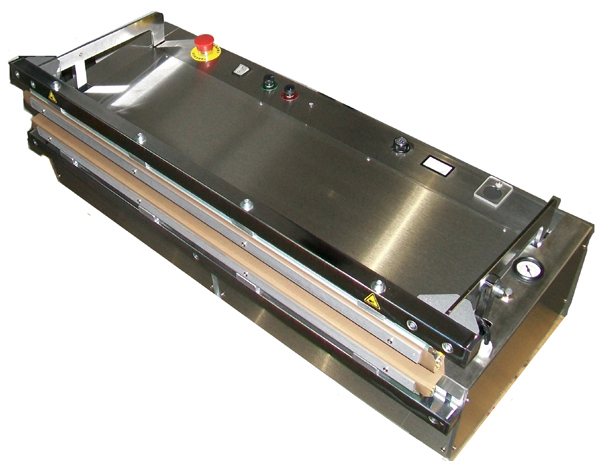 This makes the PN Prg sealers quite suitable for sealing bags placed into bins or boxes. Sealers body is in stainless steel so that they can be used in sterile rooms and protected environments.